Zoom Photo Screensaver applies Ken Burns Effect to your family photos. This effect is also known as Pan and Zoom. It makes your photos as alive as if you were watching a movie. 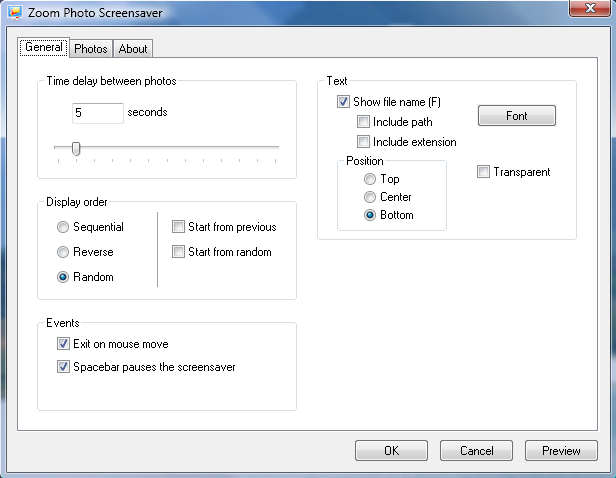 Zoom Photo Screensaver is an easy way of creating a screensaver using your favorite photos! All you need to do is specify the path to your photos - and your screensaver is ready. You can also configure the photo display order, zooming speed and other parameters for best viewing experience. You can try the program absolutely FREE! Download Zoom Photo Screensaver right away and breathe new life into your photos! This site does not contain serial number, crack, keygen Zoom Photo Screensaver serial number : serial number is the simplest type of crack. A serial number(cdkey,product key,etc) is register the program as you may already know. a crack or keygen may contain harmful software. If you cannot find the exact version you want, just give it a try. for more information read .nfo/.txt/.diz file include in zipped file.